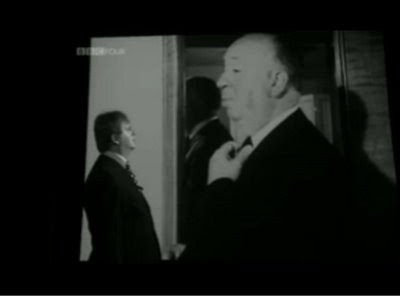 Paul Merton interviews Hitch. Well, sort of. Social media app Twitter is very, very cool. I've met over 2,000 friends, film geeks and, more to the point, Alfred Hitchcock fans. One recent new BFF is Teri Coster, a.k.a. I_am_Otaku. Here's why. As many of you know, the BBC recently aired a fantastic documentary hosted by the perennially cheeky Paul Merton. It covers a too-often overlooked part of Hitchcock's career: his early, British years. Five minutes into the show Merton reminds viewers that 23 of Hitchcock's films -- nearly half -- were made in England, and that it is here that he came up with the themes and visual style that would continue throughout his career. Well, that sounds like a cool show. Just one problem. I'm in the United States, not England, and the BBC's online tool iPlayer doesn't work on this side of the pond. When it came to seeing Merton's documentary, I was S.O.L. Nevertheless, I let my pain be known on the Twittersphere, and several of my tweeps went into action to see about getting me access to the show. Finally, Teri sent me a note yesterday, proclaiming, "I've cracked the code!" She broke the show into small segments and has posted it on YouTube. Go here for the playlist. But hurry, she's only going to have it up for a few days. Thanks to Teri and all my friends who have tried to bring this great show to a larger audience! Great to find ambitious friends like that! I suggest that you download DVDVideoSoft Free YouTube Download, if you (or anyone else, for that matter) wants to save the documentary! That is a great post! I'm so excited to watch them! i'm so pleased you finally saw this. in truth, i was thinking of you as i watched, totally forgetting you're in the States. Excellent!! Thanks to all who made this possible here in the states to see. I watched this programme - Paul Merton actually wrote and produced it himself - I expect it will in time become available on DVD.